I know it's cheap, but what is it? Hmmm...blurry pic and at an angle that obscures most of the hub. 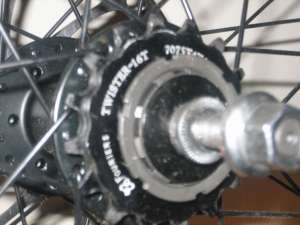 Mostly likely made by Formula or Novatec as most SS cassette hubs on the market are. When I get home I'll take a better picture. Any comments on the quality(durability) of the names you mentioned? Looks like the GT hub that comes on the Peace. Its probably just a generic painted with the purchaser's logo. In your case none. Is it cartridge or loose ball?